Stay in control of your budget & project. View your interior layouts in different styles. Experience The Power of 3D For Yourself! Our residential architects, structural engineers, interior designers and project managers can make your dream home a reality. Our team of experts have already helped hundreds of people design and build their perfect properties. Don’t delay, get started today. How close do you think you could build to a railway track. Most designers and builders laughed when the owners enquired about building a side and rear extension just 1200mm from a live railway track. We proved the non-believers wrong. Click below to see the full story. Our clients wanted to link their property with their detached garage. The brief we were given was to produce an array of designs incorporating a wine bar and or a gym. Click below to see a selection of the design produced and the 3D virtual tour. We created a new kitchen and spacious dining area for entertaining family and friends all year round. The raised patio and large sliding doors gave the effect our clients were just looking for. We created a bespoke kitchen design and saved our clients £1000s compared to their alternative quotes. Our renders can be made complete with details such as wall colours, furniture and accessories, as well as furnishing styles and finishes. 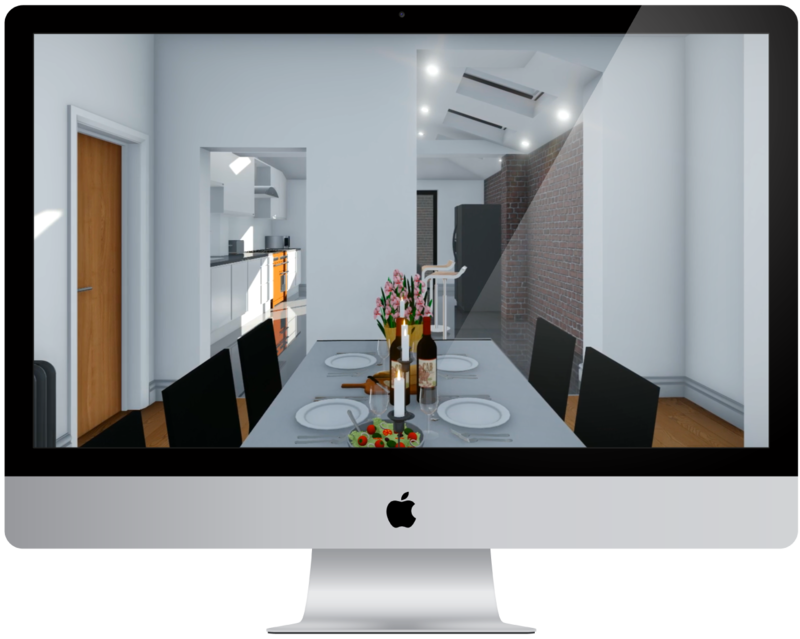 Create an exact scaled version of your room in 3D and experiment with the newly created space you can utilise. Once you are happy with your new home, our 3D designs can be directly converted in 2D plans, which can be given straight to your builder. Our 3D renders can help to identify flaws which might otherwise be overlooked through the conventional 2D approach. Once recognized, these flaws can be discussed with the client and corrected before construction work begins. Test out hundreds of paint colors to determine the most suitable, without lifting a paintbrush.